*Elevation chart for the Routeburn from the DOC. Doesn’t include the Caples Track. 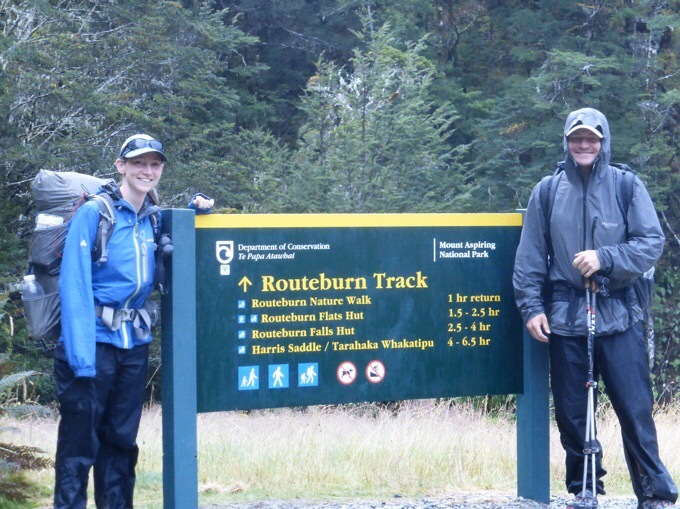 We were up early for our 7am, 30min shuttle ride to the beginning of the Routeburn Track, one of New Zealand’s 9 Great Walks. It is 18mi/30km long, and the huts and campsites require paid booking well in advance online. 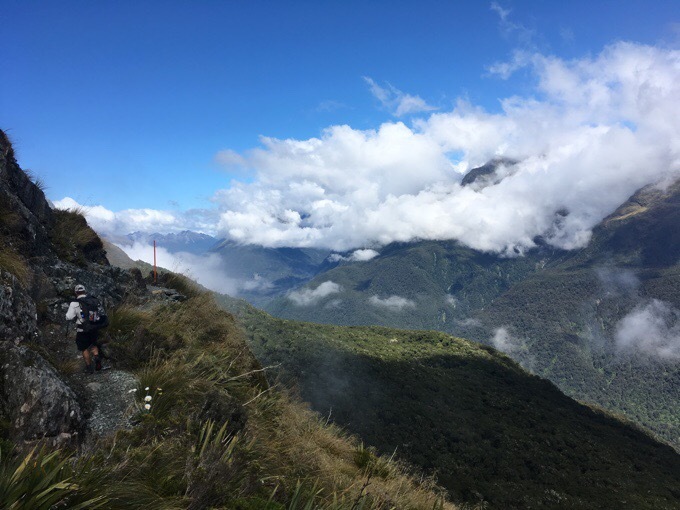 Since it is short, many TA hikers are able to do this one in a day after taking a shuttle from Glenorchy. 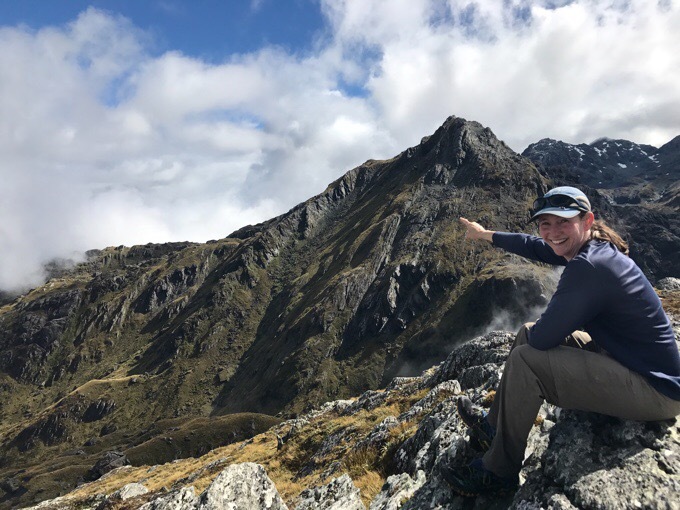 Then thru-hikers can get on the Caples Track for about 15.5mi/25km to connect back to the TA. It connects right where hikers need to take a ferry or car shuttle to get around the water hazard zone of Wakatipu Lake from Queenstown. This is our final side trip before returning to the TA to finish the last week and a half down to Bluff. Today will have less for me to write and more photos. TONS of photos were taken today. It was just a great day with spectacular scenery, and we are really glad we made the effort to do it. I don’t use that word often, but it earned it today! It started off raining for the first hour in the woods. Once again, our timing was great. 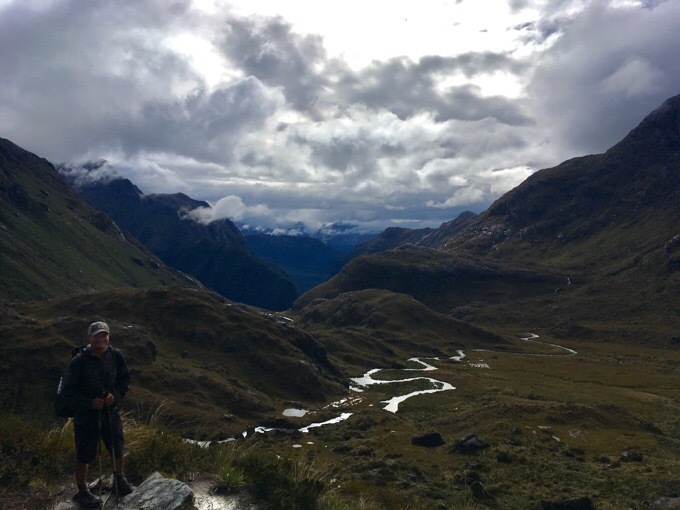 We made the right choice to zero yesterday as we heard that it did rain all the afternoon, evening, and this morning on the Routeburn. 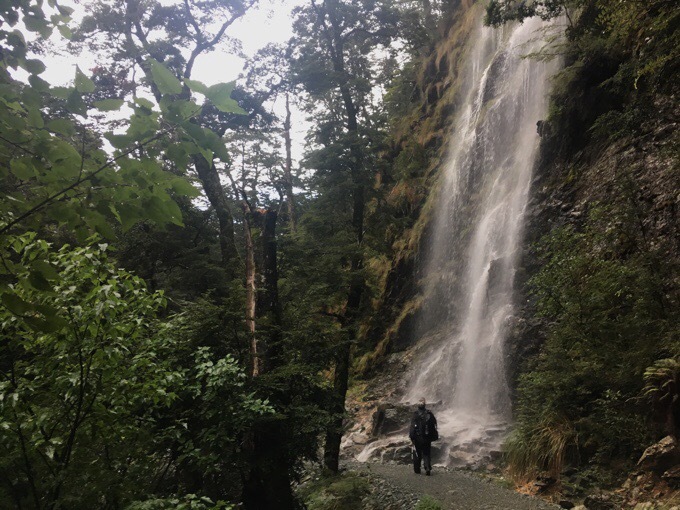 The benefit of that for us, is that we got to see all the waterfalls and rivers much bigger and we got some great cloudy scenery around the mountains. The first hour of light rain was in the woods as we hiked up out of tree line. The huts here are huge since it’s a Great Walk. 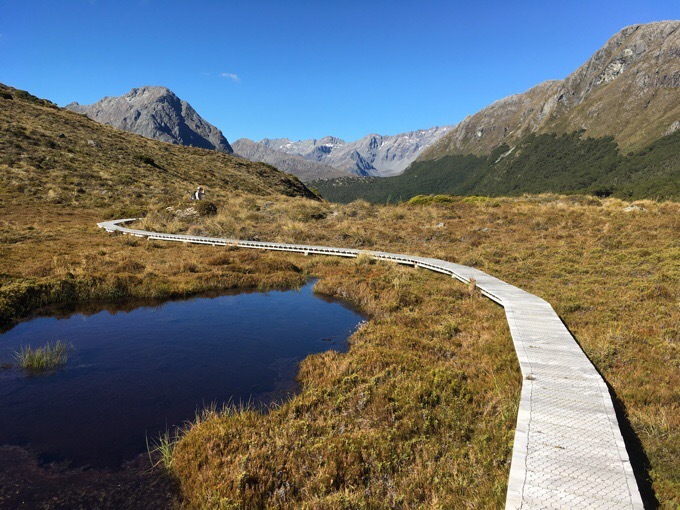 This walk in particular has a ton of guided walkers, so for each hut or shelter, right next to it is an even nicer private one for solely guided walkers. We heard people pay something like $2,000 to walk this with a guide and not have to carry much of anything. There were a lot of people with name tags in guided groups as well, but some seemed to have personal guides too. We heard this existed, but this is the one track we’ve seen this so prevalently. 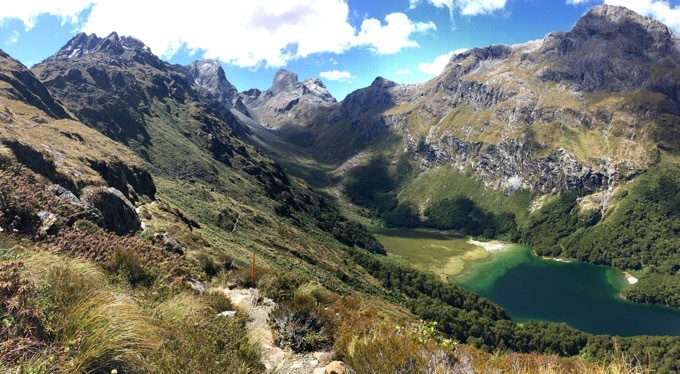 Routeburn Valley that we hiked up. 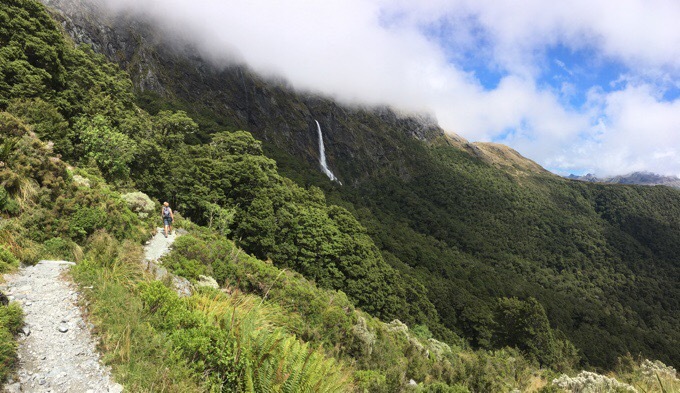 We hit Routeburn Falls Hut and the private lodge, which is next to the impressive Routeburn Falls. The flow was great! 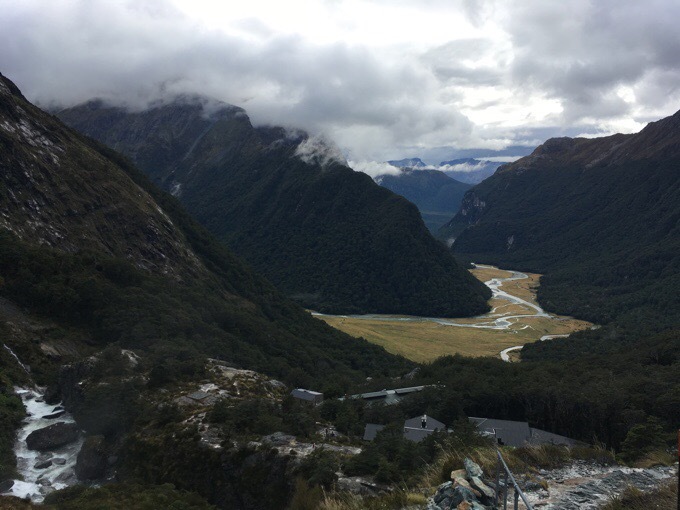 View from the top of Routeburn Falls. 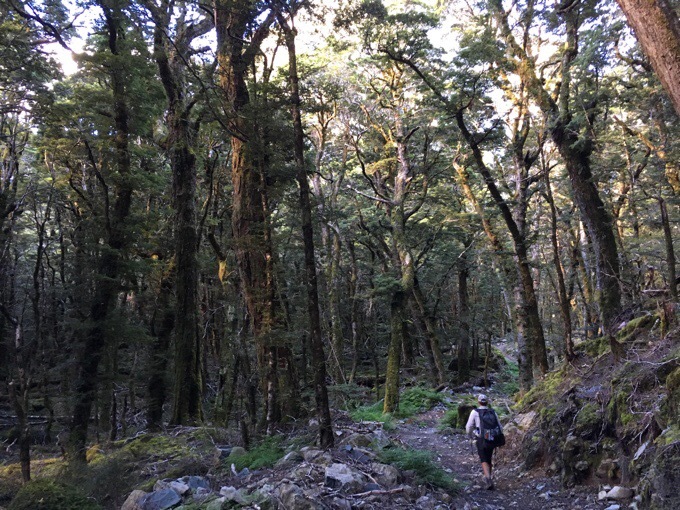 Hiking up to Harris Saddle. 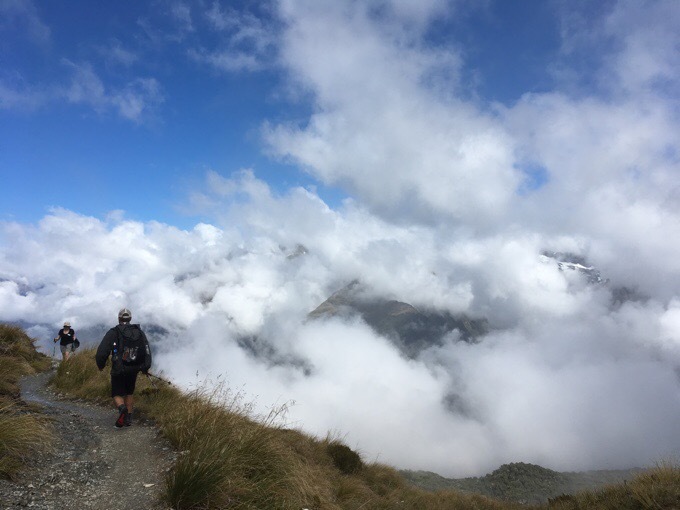 Then it was a climb up to the high point of Harris Saddle. 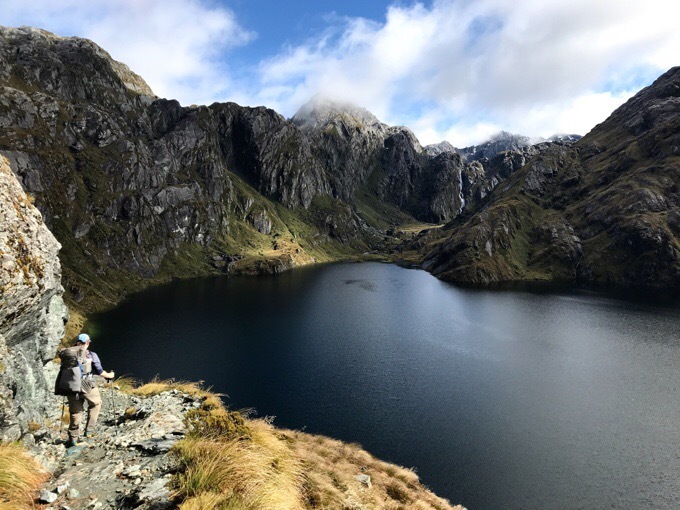 An awesome exposed walk up went along Harris Lake that had the dreamlike scenery of what you imagine New Zealand to be like. A lake, waterfall, and mountains. Many helicopters were flying over giving tours of this enchanting area and photos just didn’t do today justice, but we tried. 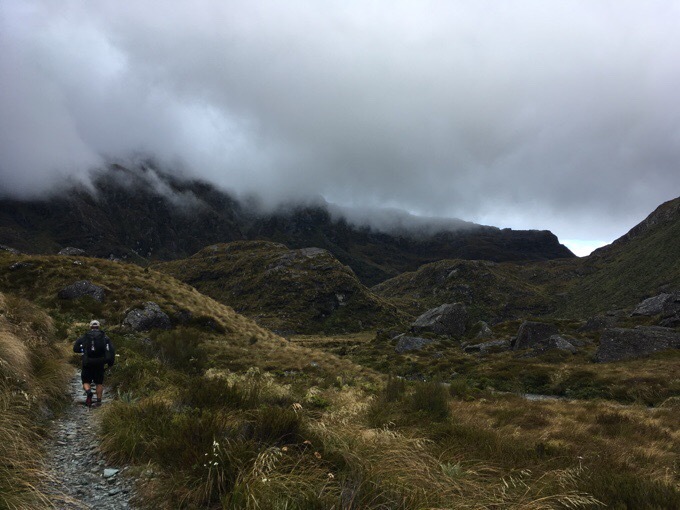 When we got to Harris Saddle, the view was covered in clouds, but lifting. We had tons of extra time, so we waited for awhile in a shelter and did the ~30min side hike up Conical Hill to see the view. The clouds were blocking much of it, but we could see mountains in bits and even the Tasman Sea for a moment. It was awesome with the clouds! Griggs got a good time lapse heading up as well! The Tasman Sea was there just a minute ago! 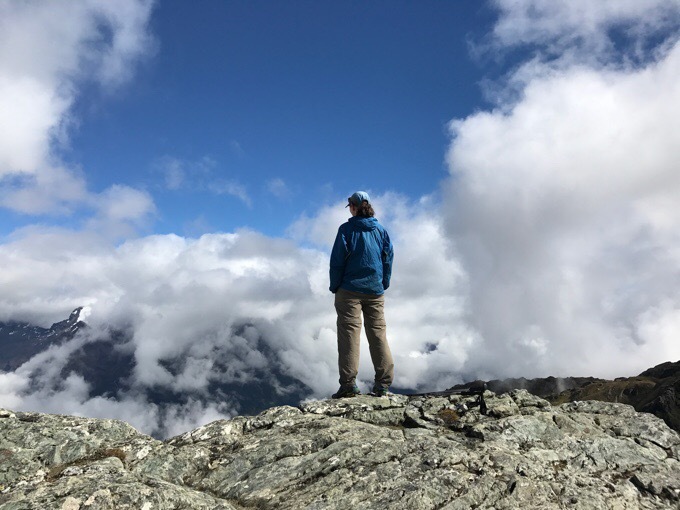 We took a relaxed lunch back at the shelter continuing to wait for the clouds to lift, and then hiked on traversing gradually downhill and overlooking the valley with great views most of the day. This 18mi/30km hike really is the most scenery per mile of anything we’ve been on. The driver this morning thought it was the best hike in this area and I agree that it was the great balance of scenery with not too much exertion. Just great! 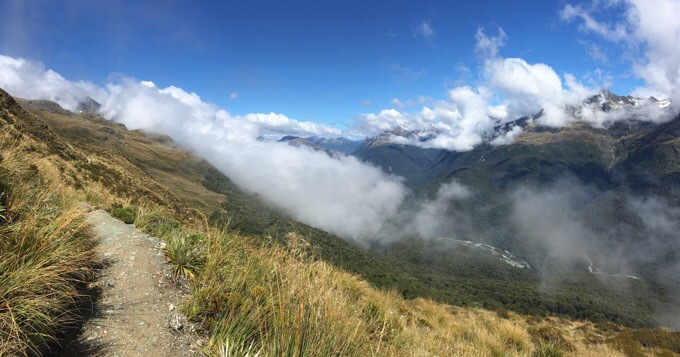 We turned down into the valley going down to Lake Mackenzie and Lake Mackenzie Hut. After that, it was mostly wooded and downhill for the end of the day. 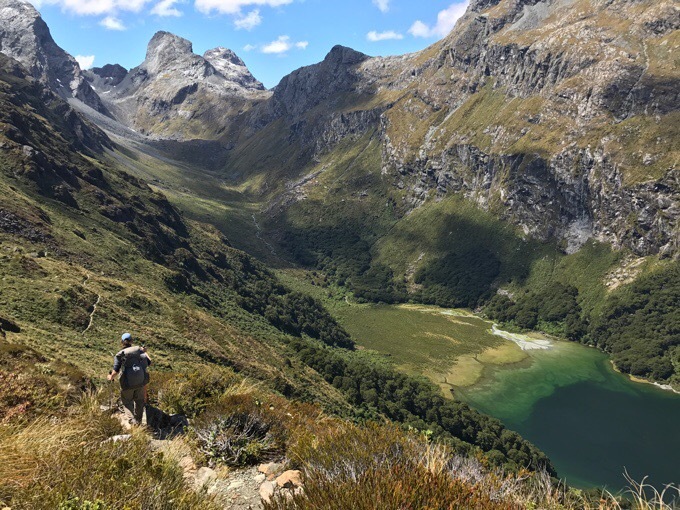 Our plan was to stop at a camping area between the Routeburn and Caples Track, but it was only 4:30pm when we got there, so we hiked on in the great weather over McKellar Saddle on the Caples Track. 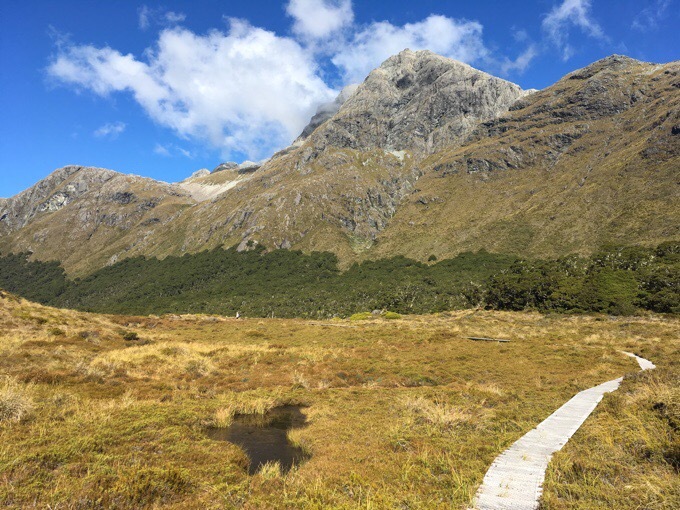 The Caples Track will connect us back to the Te Araroa tomorrow right where we left off after the hazard zone of Wakatipu Lake at Queenstone. We totally cruised the Caples Track as it has a brand new track that is super cruisey. We decided to stop at 6:45pm in some great woods near a stream. Man, what an awesome day and a great finale to all our side trips. 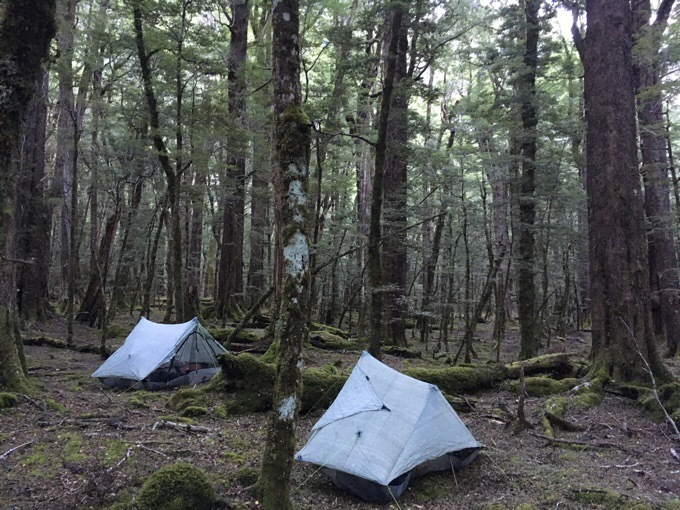 Tomorrow, back on the Te Araroa for the final stretch to Bluff in a week and a half! Sounds like a most rewarding day.. and that you are feeling much better as well, Erin. Meanwhile, back at home, I hear that Oregon has surpassed previous records for rain this season.. so you might be using that umbrella if you were on the way to teaching.. better to be hiking with it, right? So I guess we are back on the TA next and then Tassie. I really want you to see a wombat and a Tasmanian Devil.. I have a picture of the late Steve Irwin holding a wombat, that always made me smile. He would have turned 55 this week and his daughter Bindi did some tribute to him. I don’t think you got close to Zoo Australia.. but I always enjoyed Steve and his zest for life and love of wildlife. I could see him and Griggs.. Griggs enthusing about the views and Steve proclaiming “what a beauty” about the wildlife. Sounds like you and Griggs are meshing so well, style wise! So nice to read about. Those waterfalls were wonderful with all the rain..
Ha! There is always a silver lining in most situations. More days, more to stash away for the next big hike. Just gorgeous! What a trail! Hi Erin – I have really enjoyed living vicariously through your blog the past months. 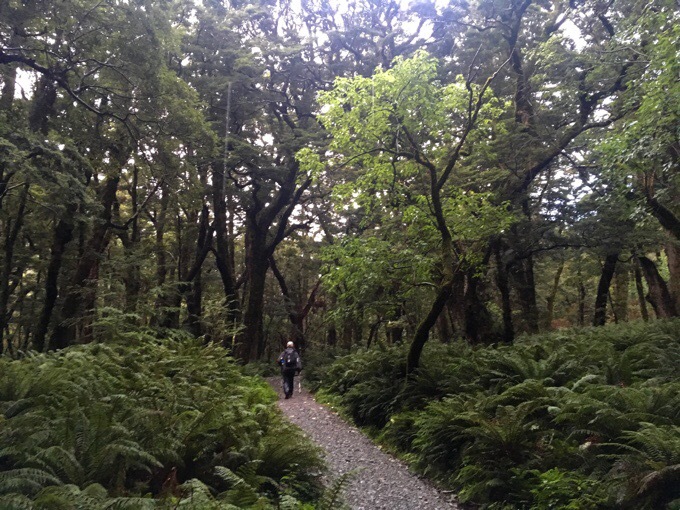 I wonder as the Te Araroa matures if they don’t decide that some of your side trips should be incorporated into the main trek. 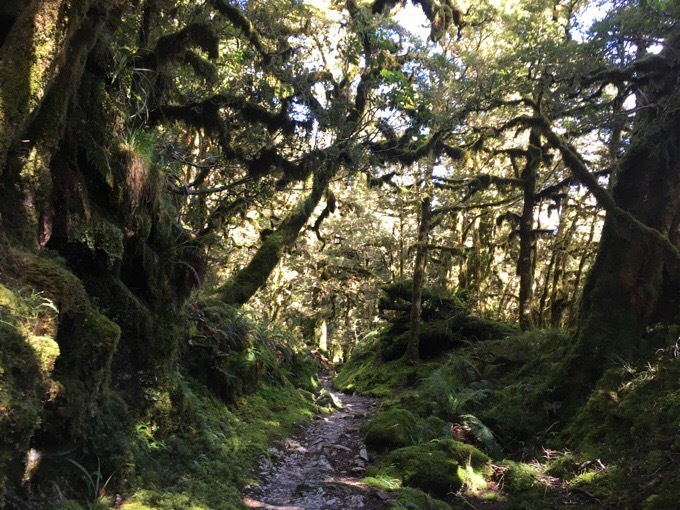 Given the spectacular scenery it seems a shame for most Te Araroa walkers to pass them by. Enjoy your last days in NZ. 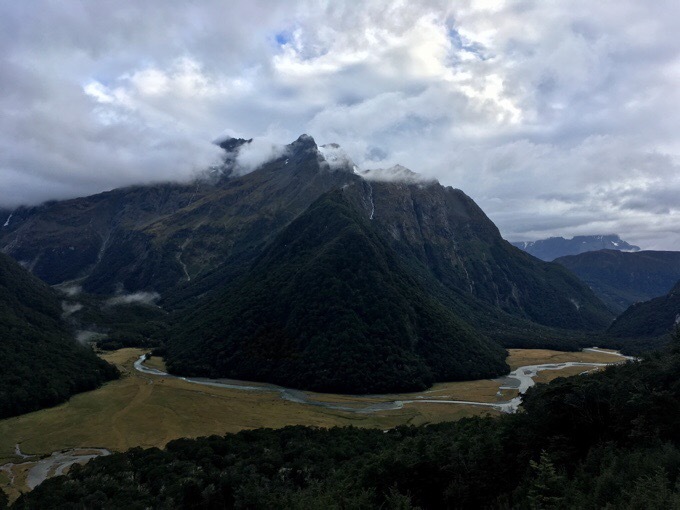 Yeah, I’ve heard they have purposely kept it off the higher trafficked Great Walks and such and purposely have it in the lesser traveled parts of NZ to spread out tourism and such. 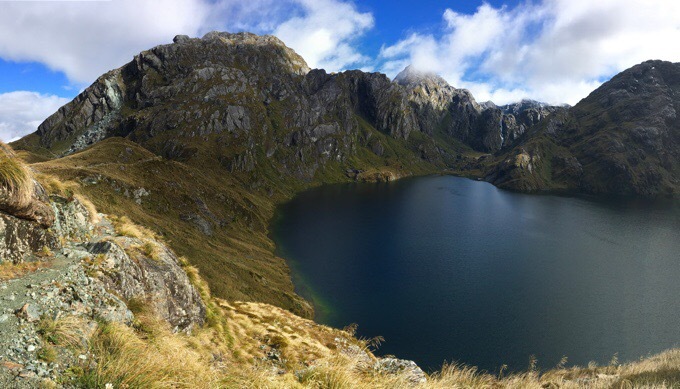 Just six seconds up Conical Hill; wow you truly are Wired!!! So guess what?? 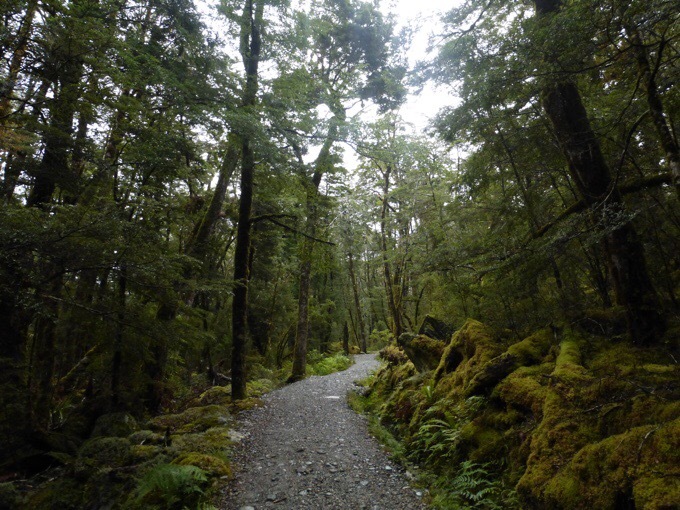 I am doing the Routeburn in January!! I am so beyond excited and can’t wait to visit NZ! 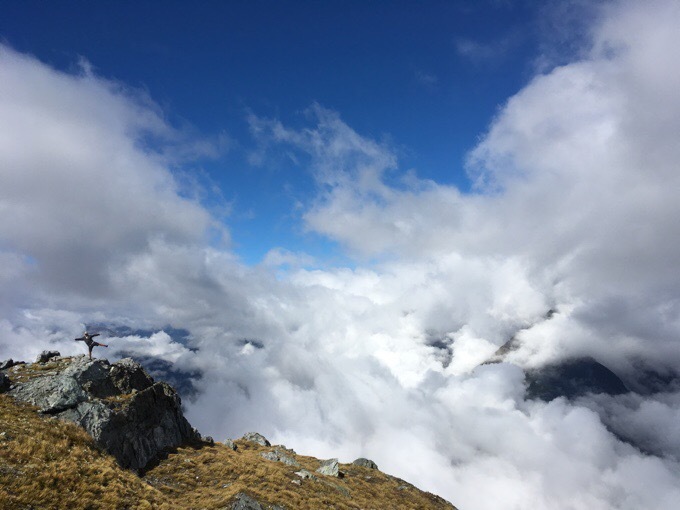 Your kiwi hikes were definitely an inspiration, actually, all your hikes in general are inspirational! Lol.